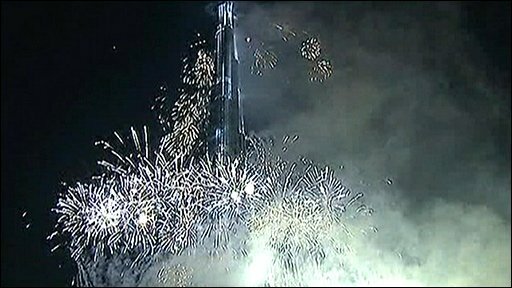 The world's tallest building has been opened with a dramatic fireworks ceremony in the Gulf emirate of Dubai. Known as the Burj Dubai during construction, the tower has been renamed after the leader of Dubai's oil-rich neighbour, Abu Dhabi. The tower also lays claim to the highest occupied floor, the tallest service lift, and the world's highest observation deck - on the 124th floor. The world's highest mosque and swimming pool will meanwhile be located on the 158th and 76th floors. The opening ceremony, held 1,325 days after excavation work started, was attended by some 6,000 guests. Though not complete on the inside, it was officially opened by Dubai's ruler, Sheikh Mohammed Bin Rashid Al Maktoum. In a surprise move he renamed it Burj Khalifa - after the president of the United Arab Emirates and emir of Abu Dhabi, Sheikh Khalifa bin Zayed Al Nahayan. 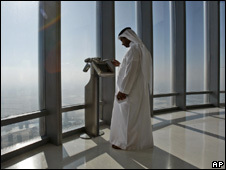 Sheikh Mohammed described the tower as "the tallest building ever created by the hand of man". "This great project deserves to carry the name of a great man. Today I inaugurate Burj Khalifa," he said. Sheikh Mohammed also unveiled a plaque inside the tower bearing the new name. At 828m, Burj Khalifa dwarfs the 508m Taipei 101 and the 629m KVLY-TV mast in the US, the tallest man-made structure. Its spire can been seen 95km (60 miles) away. "We weren't sure how high we could go," said Bill Baker of Skidmore, Owings & Merrill, the building's structural engineer. "It was kind of an exploration... a learning experience." 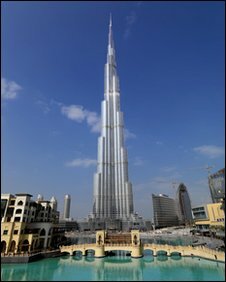 Mohamed Ali Alabbar, chairman of Emaar Properties, the developer behind Burj Khalifa, told the BBC that the building's design had posed unprecedented technical and logistical challenges, not just because of its height, but also because Dubai was susceptible to high winds and was close to a geological fault line. "We have been hit with lightning twice, there was a big earthquake last year that came across from Iran, and we have had all types of wind which has hit us when we were building. The results have been good and I salute the designers and professionals who helped build it," he said. The design incorporates ideas from traditional Islamic architecture, while the open petals of a desert flower were the inspiration for the tower's base. However, investors are facing losses even before the tower is completed because property prices in Dubai have slumped amid the global economic crisis. Some apartments were selling for $2,700 per sq ft, but are now going for less than half that. Analysts say it will be particularly hard to lease office space because few companies can justify paying premiums for luxury. The BBC's Malcolm Borthwick in Dubai says developers are holding back on new flagship projects, so Burj Khalifa could mark the end of an era for skyscrapers in the Gulf - at least in the short term.